There was a bug with Dupin running under High Sierra that distorted the buttons in a Purge dialog and made them somewhat un-responsive. I hadn’t seen this in the 10.13 betas so I wasn’t expecting any issues when the final release of 10.13 came out this week. Luckily, an alert Correspondent let me know about it and I fixed it right up this morning. Current users can “Check For Update…” in Dupin’s application menu or download the latest version on this page. I’ve also submitted an update for Dupin Lite 2 and that should be up on the App Store in a day or so. I’ve posted Dupin v2.12.0 which has initial accommodations for macOS 10.13 High Sierra. 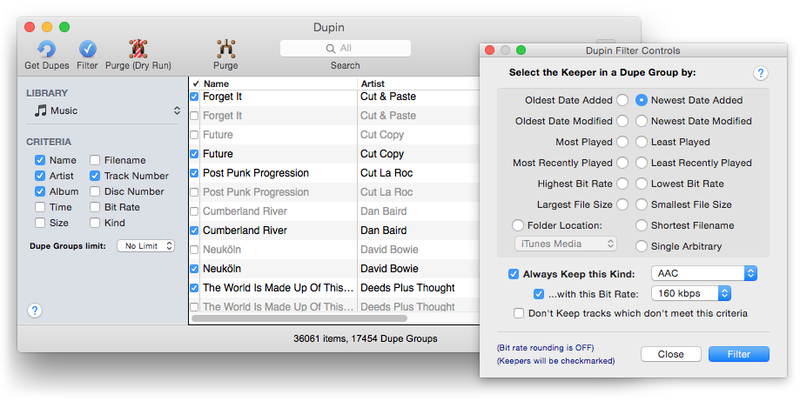 Dupin is the iTunes Duplicates Manager. In addition to the macOS 10.13 considerations and obligatory performance enhancements, I’ve added a “Reset to All Keepers” button to the Filter Controls. I don’t know what took so long on that. There is also a new “Local files” option added to the “Always Keep this Kind” popup. The View menu now allows you to select to view only Dupe Groups that contain dead or cloud or local file tracks. The Library Profile utility in the Help menu has also received some improvements. Dupin v2.12.0 is free to try in Demo Mode during which it will only operate on twenty Dupe Groups at a time with one “Purge” operation allowed per launch for up to eight launches. A registration code to remove the Demo Mode restrictions is $15.00. This update is free if you purchased your current registration code within the last five years. Out-of-date registrations can be updated for $5.00 by downloading and launching the latest version and making an in-app purchase. More information, links to the FAQ page, quick-start video and download is available from this page. Current users can hit “Check for Update…” in Dupin’s menu. 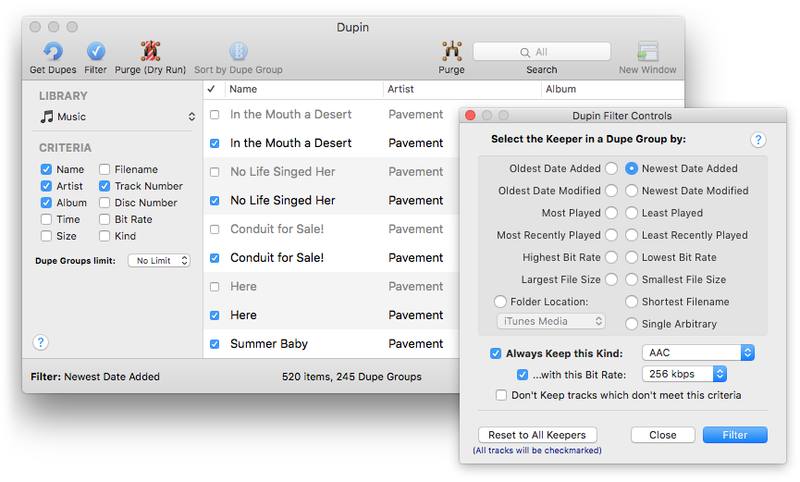 I’ve posted a minor maintenance update to Dupin, the iTunes duplicates manager. I had to fix a minor incompatibility issue with how OS X 10.11 displays a Quick Look window. Comes in handy when you need to audition the tracks without having to locate them in iTunes first. 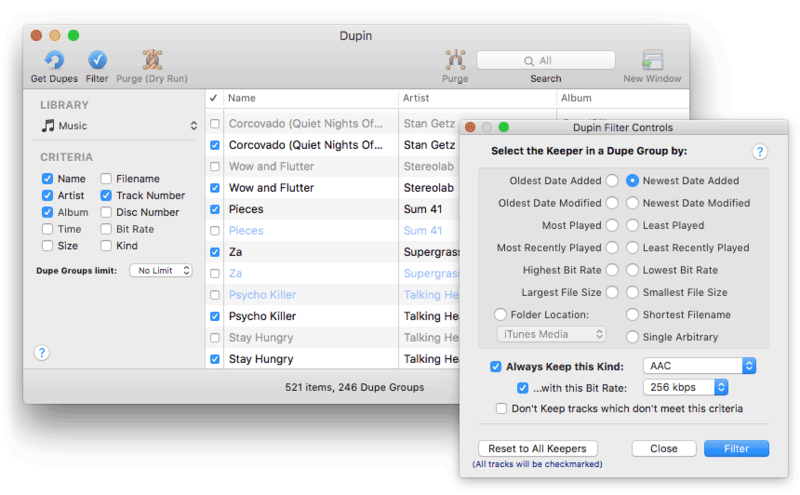 Dupin ($15.00) has many other features that will help you manage (and perhaps eventually Trash) your iTunes duplicates, like flexible dupe filtering, Re-Playlisting, “dead” track removal, and more. And it’s compatible with iCloud Music Library tracks. 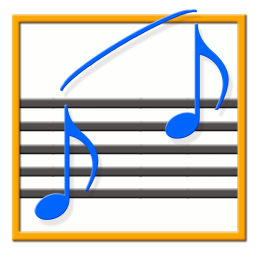 This latest version (v2.10.2) is a free update for registered users. This latest version is a maintenance release with performance enhancements and is a free update for registered users. Dupin is easy to configure and use. Get the well-featured demo and try it out for yourself now. I fixed a couple of bugs that occur with iTunes 12.2, mostly cosmetic. Click “Check for Update…” in your current version or download the lateset from here. 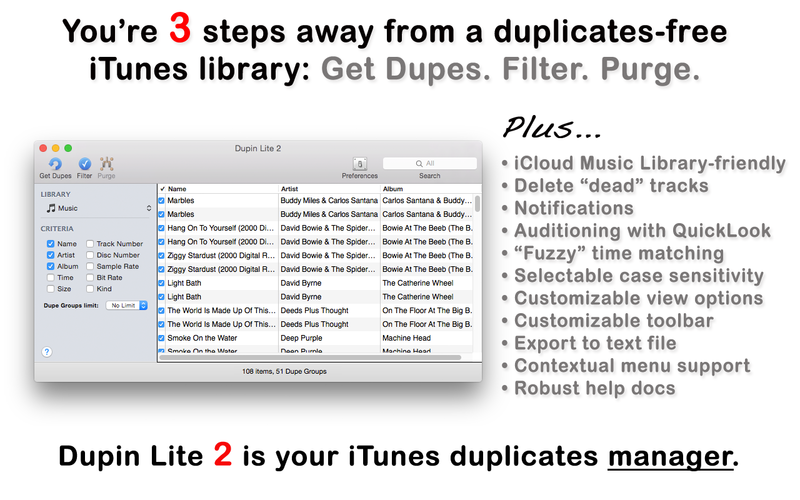 Similar bugs showed up in Dupin Lite 2 and a new version has been submitted to the Mac App Store for review. It should be available from there in a few days. 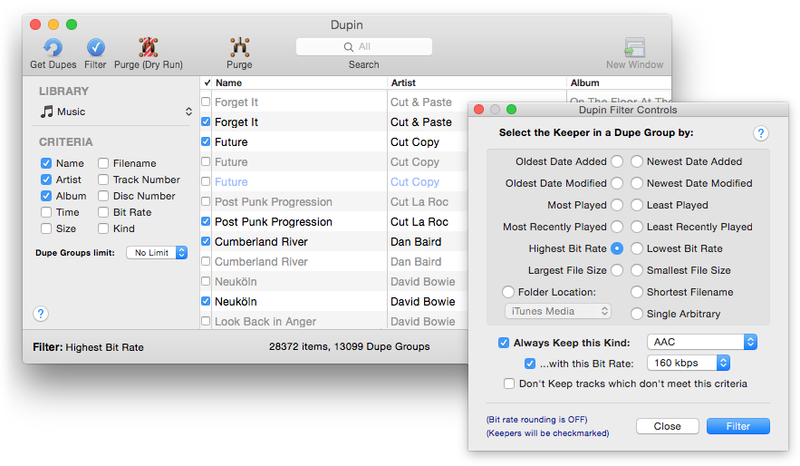 Dupin v2.8.6 is now available. This is a maintenance update that includes some minor performance enhancements, a fix for potentially slow progress indicator animation under Yosemite, and preliminary support for the OS X 10.11 beta. You can download the latest version of Dupin here, or click “Check for Update” in your current version. You can get it from the web page here or fire up your current version and click Check For Update from its application menu. 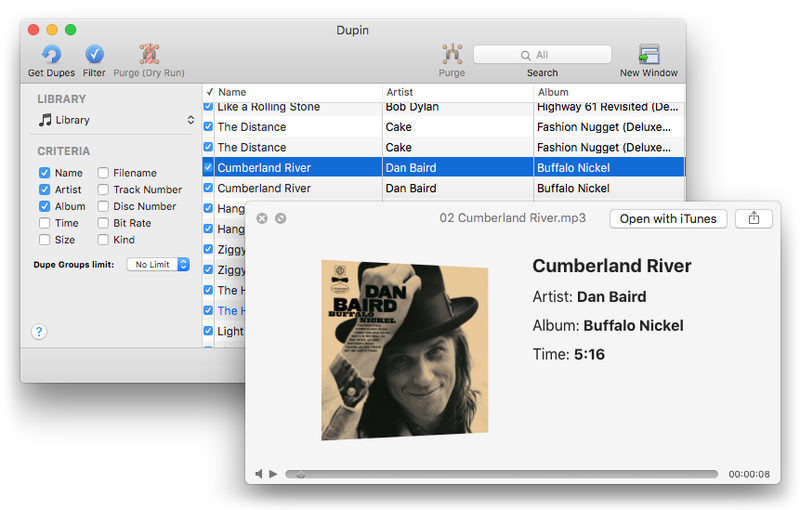 This latest version of Dupin: fixes a problem when Re-Playlisting whereby playlists stored in Folder Playlists would either not be correctly re-created or not put back to their source Folder Playlist; fixes an issue Re-Playlisting when dead tracks are extant; fixes a bug encountering empty playlists when using the Remove Duplicate Entries From Playlist tool; other minor fixes and enhancements. The unregistered demo version of Dupin will display up to 20 sets of duplicate tracks per session and permit a single “Purge” operation per launch. All other features are unencumbered. A registration code for Dupin is $15.00. Over the weekend, I released a version of Dupin that was basically a simple maintenance release. However, it was then brought to my attention that a bug had been in existence since v2.8.2 which errantly moved files to the Trash when using Dupin to remove tracks from a playlist. This isn’t an often-used featuremost users just want to delete the tracks and Trash the files from the entire librarybut you can imagine the problem this would cause when the last thing you expected while just removing tracks from a playlist is to find that the files had been Trashed as well. I have fixed that issue in version v2.8.4 of Dupin.